Wondering how to make your home more eco-friendly to reduce your environmental impact? 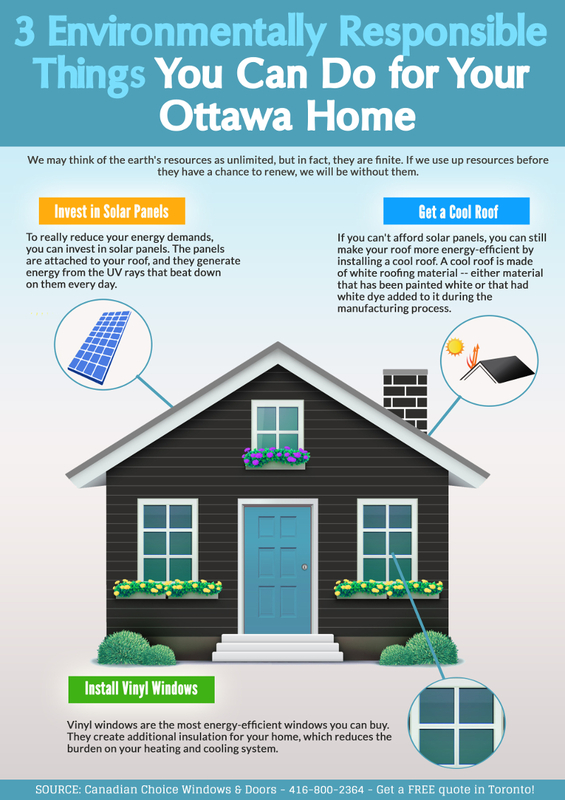 Take a look at our latest infographic to learn what improvements you can make to your home to make it greener. We may think of the earth's resources as unlimited, but in fact, they are finite. If we use up resources before they have a chance to renew, we will be without them. Some resources are not renewable at all. Consumption of some resources also produces toxic gases and emissions that contribute to pollution and global warming. Vinyl windows are the most energy-efficient windows you can buy. They create additional insulation for your home, which reduces the burden on your heating and cooling system. Your home won't use up as much electricity, which will save you money and will reduce the demand for natural resources like oil and coal. If everyone installed vinyl windows on their homes, imagine the savings we could all generate. To really reduce your energy demands, you can invest in solar panels. The panels are attached to your roof, and they generate energy from the UV rays that beat down on them every day. Once you pay to have the panels installed, you don't have to pay any more money to keep them going (outside of regular maintenance). Meanwhile, the panels will create energy that can be used to power your home or that can be sold back to the local utility company for an energy credit. If you can't afford solar panels, you can still make your roof more energy-efficient by installing a cool roof. A cool roof is made of white roofing material -- either material that has been painted white or that had white dye added to it during the manufacturing process. The white surface reflects the rays of the sun, bringing down the temperature of the home and putting less strain on the cooling system. Making environmentally responsible decisions doesn't just help the plant - it always helps your wallet. Give us a call if you want to have your windows replaced in Ottawa and start reaping the benefits of vinyl windows. You'll save money on energy costs, reduce your carbon foot print, and increase the value of your home.